A pair of primordial black holes have been spotted so far awaythat they likely formed relatively soon after the Big Bang, scientists announcedWednesday. The primitive form of the black holes suggests that they werecreated when the universe was much different than it is today. The Big Bang is thought to have formed our universe about 13.7billion years ago. The newly discovered black holes appear to be about 13billion light-years away from Earth, meaning their light traveled 13 billionyears to get to our telescopes. So scientists must be seeing them as theylooked less than a billion years after the birthof the universe. The black holes are extremely bright objects called quasars,where matter falling into a black hole flings out powerful jets of light intospace. But these odd-ball quasars lack the hot dustthat is usually seen in such objects. That tells the researchers that they may have been createdso early in the universe's history that dust did not yet exist. "We think these early black holes are forming aroundthe time when the dust was first forming in the universe, less than one billionyears after the Big Bang," said Xiaohui Fan, an astronomer at theUniversity of Arizona. "The primordial universe did not contain anymolecules that could coagulate to form dust. The elements necessary for thisprocess were produced and pumped into the universe later by stars." Fan and his team detailed their discovery in the March 18issue of the journal Nature. The researchers discovered the two dust-free quasars,called J0005-0006 and J0303-0019, using NASA's Spitzer Space Telescope, whichobserves the universe in infrared light. Until now, no quasars have beenspotted without dust anywhere in the universe. "This is a remarkable ? and puzzling ? result, becausehot-dust emission was thought to be a ubiquitous feature of quasars,"wrote astronomer Giulia Stratta of the ASI Science Data Center in Italy in anaccompanying essay in the same issue of Nature. Stratta was not involved in theresearch. "These apparently hot-dust-free quasars have no analogues[nearby]." Another odd aspect of the two blackholes is that they are the smallest in the sample of other distant quasarsin which they were found. These two have masses of about 200 million to 300million suns, while the rest of their peers generally weigh even more. 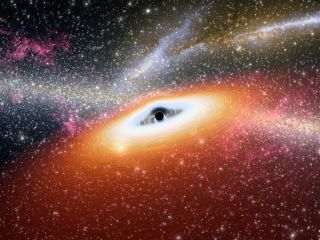 This clue also points to these quasars being extremely youngand at an early stage of development, the researchers say. "It appears we have found what are likely primitive first-generationquasars, that are born in a dust-free medium shortly after Big Bang," saidco-researcher Marianne Vestergaard, an astrophysicist at the University ofCopenhagen in Denmark. "It is fantastic that we are witness to thisbuilding up of black holes and the amount of heavier elements in the form ofdust." It is only because quasars are so bright that these youngobjects near the horizon of our universe are visible. "Quasars emit an enormous amount of light, making themdetectable literally at the edge of [the] observable universe," Fan said.